The Missouri Bill of Sale Forms are legal documents that are utilized between buyers and sellers of various boats, vehicles, firearms and even personal items that provide information with regard to the seller, the buyer, and the item(s) being sold. These documents provide change of ownership information and are often needed for various registrations. Some documents will require notarization to better authenticate the information and the legality of the sales. Boat Bill of Sale – This document would be used to prove the purchase and change of ownership of a vessel/boat and will prove change of ownership. General Bill of Sale – These forms are most generally utilized between two private parties for the proof of sale and change of ownership of personal items. Firearm Bill of Sale – Use of this document will provide legal proof of sale of a firearm, it will provide required information with regard to the seller, buyer and the firearm itself. It will also provide information with regard to change of ownership. Motor Vehicle Bill of Sale – Is to be used to prove the legal sale and purchase of a motor vehicle. 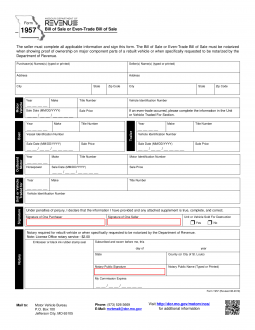 The form provides all information needed for a change of ownership, seller and buyer information and may be used for registration of the vehicle. You must provide a Personal property tax receipt or completed statement of non-assessment form.